My parents have had quite the bumper crop of raspberries at their home in southwest Washington this year, and my mum and I have been racking our brains for interesting new recipes in which to use them. We have also – inexplicably – been talking about making a clafoutis for years, despite never having tried one. Hundreds of raspberries + irrational clafoutis obsession = raspberry clafoutis! What the heck is clafoutis, you might ask? Clafoutis (pronounced klah-foo-tee) is a French dessert of stone fruits arranged in a buttered dish and baked in thick, custard-like batter. Originating in the Limousin region of central France, clafoutis is typically made with whole, stoned cherries, but can also be made with other fruits, including plums, pears, or apples. 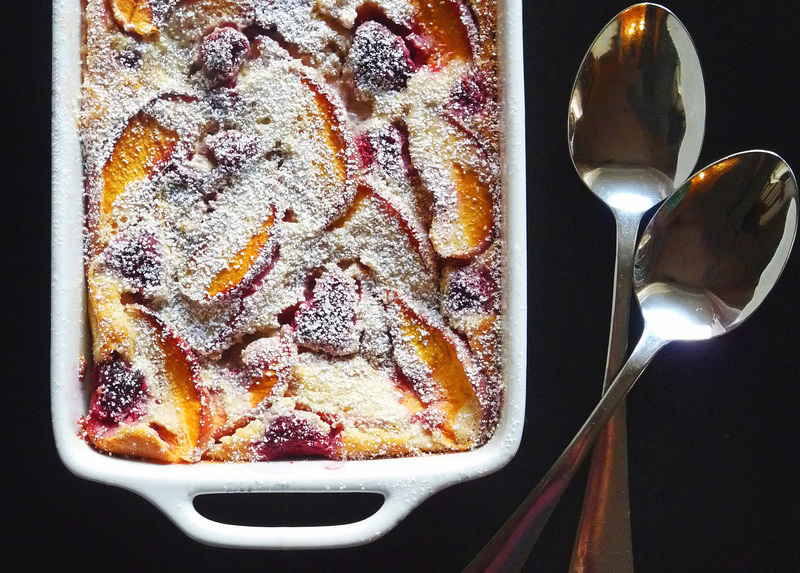 I went a bit rogue with this recipe (adapted from Woman’s Day), using peaches and raspberries instead, which technically makes this dessert a flaugnarde (for all intents and purposes, a non-cherry clafoutis). That said, my mum and I were crushed at the prospect of having our clafoutis dreams dashed, so … we’re calling it a clafoutis. 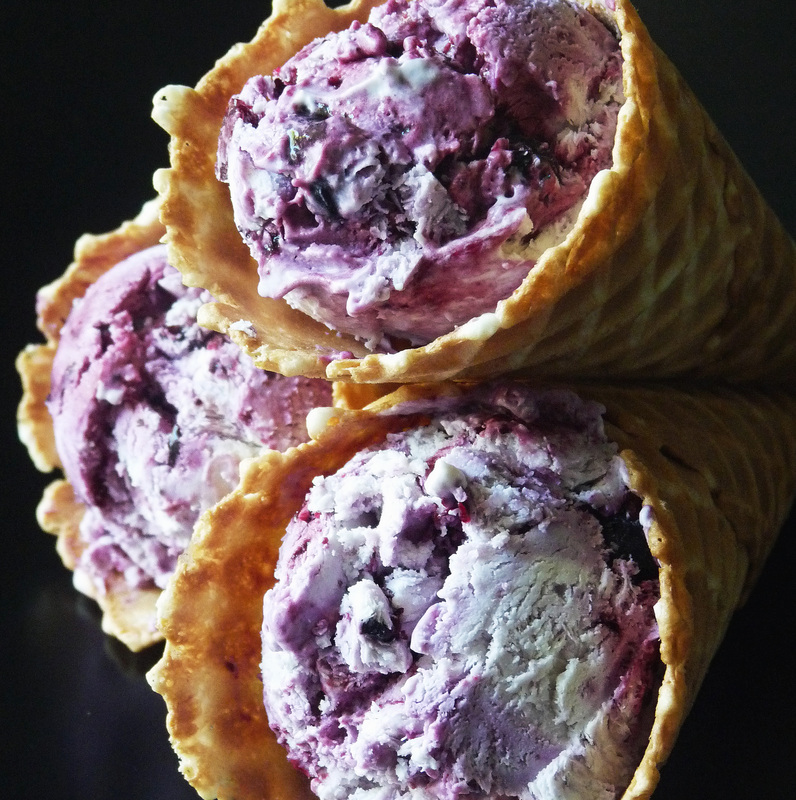 Call it whatever you want, just make it – it’s so yummy! When I make this again, I’ll double the raspberries and omit the peaches. I LOVE peaches, but very little peach flavor comes through in this recipe (and the raspberries are fantastic!). Otherwise, its delicious served warm as breakfast or dessert – enjoy! Heat oven to 350 degrees Fahrenheit (175 degrees Celsius). Grease a shallow 2 1/2-quart baking dish with the butter and lightly dust with granulated sugar. In a medium bowl, finely grate the lemon zest (about 2 teaspoons), then squeeze in 1 tablespoon juice. Add the peaches, raspberries, and 1 tablespoon granulated sugar and gently toss to combine. Using a sharp knife, cut the vanilla bean in half lengthwise and scrape out the seeds. In a blender, combine the eggs, milk, flour, salt, spices, 1/2 cup heavy cream, remaining 1/2 cup granulated sugar, and vanilla seeds and pulp (discard the pod). Blend on high until slightly frothy, about 1 minute. Transfer the fruit to the prepared pan along with any juices and pour the batter on top. Bake until just set, 45 to 50 minutes. Let cool for 5 minutes. Dust the clafoutis with confectioners’ sugar and serve with softly whipped cream or ice cream, if desired.